Weinbach’s article takes a look at why and also considers the role of parks today. As Weinbach points out, “Developers who once fought with conservationists are now pushing the idea, after discovering that successful parks -- such as Manhattan's Bryant Park and Atlanta's Piedmont Park -- can dramatically increase property values." “City leaders are also using parks as a marketing tool. In an effort to draw young professionals and graying suburbanites, a number of cities including Denver, Philadelphia and San Diego have gentrified their downtowns recently. But politicians are finding that most of the new residents grew up with access to running trails, sports fields and the like -- and expect to have the same access in the city.” Click here to read the article. Here are some statistics about the restoration of Bryant Park and the increase in nearby property values after the park's restoration. It can happen here in Memphis on the riverfront without expensive new projects. Bring the river into the heart of the city with improvements to the historic Public Promenade and Cobblestones, connect the parks now dotting the riverfront, clean-up the area, improve and enhance the beauty, illustrate the rich history, make it safe and people friendly ... and we will encourage sustainable redevelopment in the core of downtown Memphis. 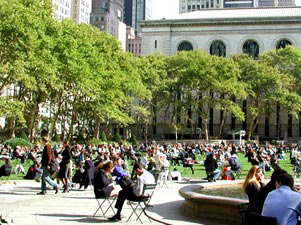 Neglected and over-run with drug dealers, Bryant Park was once nicknamed “needle park.” Today it is described as one of the most gracious public places in the world.